I had been collecting crystals for years, despite the fact that I had no idea how to use them. The first was a Celestite egg that I found in 2009 when I first moved to London. Maybe I was drawn to their light, energy and color. My favorite had always been Amethyst though I now prefer the clear quartz variety, especially when you put them out in the sun to charge their energy. Take the lovely point below, and how the sun sparkles through the shadows. The more we connect with crystals, the easier it is for us to sense their vibes. You can hold crystals during meditation, though I have also noticed that just admiring them for a few minutes activates their energy. Its worth mentioning that new crystals should always be cleansed, regardless of their vibes, before we start working with them. Crystals are quick to absorb energy from their surroundings, whether its a shop or a previous owner's home and family. There are crystals for just about any purpose: courage, prosperity, love, luck, grounding, intuition, relaxation, astral travel, the list goes on and on. 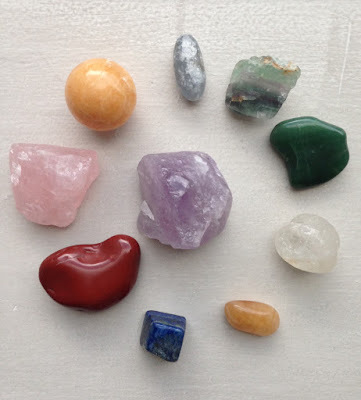 We can also choose crystals according to our star signs, or even by Chakra. If we're at a loss, clear quartz crystals are a good place to start because you can program them for any purpose. Beyond that, I like to choose the crystal I'm drawn to, cleanse it, and work with it for a few weeks before looking up its purpose. This makes the process a bit more intuitive. Amethyst. This lovely purple stone happens to be my birthstone and its always been my favorite. Its said to boost our intuition, heal and protect by transmuting negative energy. Maybe that's why we often use violet light to protect ourselves during meditation. I also find that amethysts help us wake up magically, so we can work with energy healing, intuition and Intention to create positive change in our lives. Orange Calcite. I discovered my Orange Calcite sphere by chance, while looking for the white variety that's known to boost our ability to sense and channel messages from the angels. Instead I was drawn to the orange variety and I later discovered that its meant to replace fear with enthusiasm, making it easier for us to find the necessary courage as well. Citrine. I can only describe this one as cheerful, it makes me feel downright giddy. We can connect with this yellow stone to boost our self-esteem and replace negative thoughts with positive ones. It's also linked with my rising sign of Gemini, maybe that's why it resonates. Clear Quartz reminds me of Superman's Cave, the one he goes to when he wants answers from his galactic family. Quartz can be programmed for just about any purpose but its especially useful when we want to activate our intuition and connect with your angels, guides or to get a sense of other dimensions. I have a beautiful quartz sphere that I use for meditation, but I find that small tumbled stones are just as effective when we want to activate our clairvoyance. Hold the quartz in your hands and peer into it with your Third Eye Chakra. Green Aventurine makes me feel lucky and why wouldn't it? Green Aventurine is a prosperity stone that is often associated with Jupiter, the planet of good luck and expansion. It is also a Heart Chakra stone which makes perfect sense, as my intuition tells me that we receive through the Heart Chakra. Work with Green Aventurine to manifest opportunities for yourself, while opening your energy and your Heart to receive all of those wonderful blessings. Lapis Lazuli doesn't look like a crystal, is a solid blue stone with gold flecks. Lapiz is an intuition booster, working on our Throat and Brow Chakras to activate our psychic skills. In all honestly, I find it beautiful but the stone's energy has never resonated with me. Rose Quartz amplifies the vibrations of love, it's a great Heart Chakra crystal. A few months ago I started using it in energy healing exercises, holding a big rose quartz in my hands and intending for its lovely energy to flow up my left arm, through my Heart and down my right arm again. This circle of energy boosts our ability to give and receive love and abundance, because as mentioned above, we receive via the Heart. Red Jasper calms me down quite a bit. I found a piece that fits in the palm of my hand, wonderful for meditations. Red Jasper activates and heals the Root and Sacral Chakras. I am new to this one as well, so that's all I have to say for now! It has lovely energy. My approach to crystals so far has been fairly intuitive, only recently have I signed up for classes. While its easy to become a crystal shopaholic, I should also mention that we can connect with the energy of crystals and healing in meditation without having them in our possession. We can this by incorporating crystals in our grounding meditations: simply visualize tree roots growing out of the bottoms of your feet into the ground, cutting through layers of rock, dirt and concrete until they wrap around a huge quartz in the center of the earth. Let your Intuition fill in the blanks with a specific color. Let your roots wrap around that crystal, drawing its energy up through the earth to your body. We can also visualize crystals on each of our Chakras (see here for details). End by placing a bubble of protective light around your body.